Sometimes, you have to drop everything in order to follow your dreams. That may sound like a cliché but some of the most fulfilled and passionate artists had to let go of comfort in order to pursue what they love. For Kenton Dunson, that love is hip hop. After dropping his job as a financial adviser to pursue his career, the artist (now known as just Dunson) is ready to showcase his latest creation. Investment is an exciting record filled with awesome samples and great catchy vibes meant to be listened to. Filled with traditional beats and professional rap skills, it’s easy to find this compilation as uplifting and a mood maker. From the onset, Dunson assures you that he’s got you covered for the duration of the album. Blue Chip, starts strong with a catchy, Kanye-like swagger. Confident yet not imposing, the song features rhythm that’ll turn you into an instant fan. Meanwhile, Count On It is another catchy single that samples a very familiar track you might have heard as a kid on Sesame Street. The song mashes elements of fun along with some serious narrative lyrics from Dunson. It’s one of my personal favorites in the album while Cross Town Lovers gets a little help from Grammy winner/songwriter, John Legend. 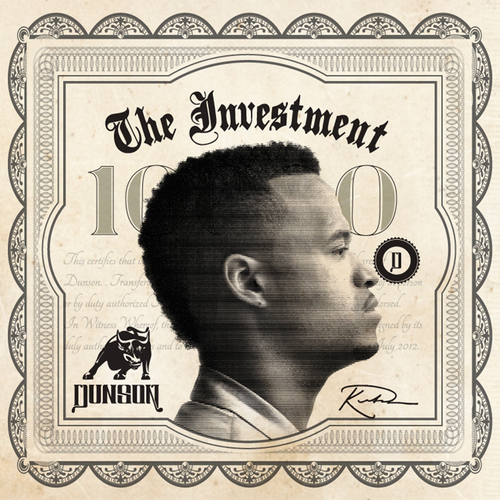 Investment is in many ways a traditional “hip hop” record. Filled with fresh samples, awesome mic skills, clever beats and just overall catchy hooks everywhere. Even if you might not be a super fan of Dunson just yet, it’s easy to pop the album and just enjoy it. Listen for yourself; this will be worth grabbing.